WORLDWIDE: Recent project updates from the Block Island project in the US, and sites in Denmark, Belgium, the Netherlands and the UK's Humber Gateway. 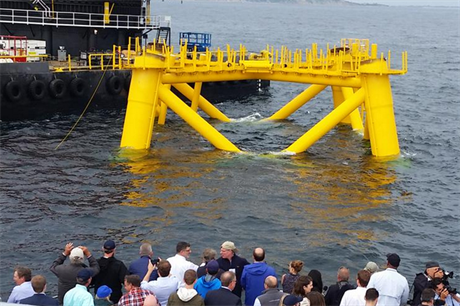 Barge incident: One of the legs of the first of Block Island's five jacket foundations has been slightly damaged after a barge hit it. The barge was being used during the 30MW project's construction, but no impact on the construction timetable is expected. Set to become the USA's first offshore wind farm, Block Island is begin developed by Deepwater Wind in Rhode Island Sound. Surveys begin: Seabed surveys and data gathering are under way, at the site of the planned Horns Rev 3 project. The 400MW wind farm is being developed by Vattenfall, in the North Sea off Esbjerg. MHI-Vestas was named as the preferred turbine supplier for the project in June. Cabling contract: Prysmian will supply the inter-array cables to the 165MW Nobelwind (Bligh Bank Phase II) project off Zeebrugge, Belgium. It will design, manufacture and supply the 33kV cables and provide termination and testing services. The cables will be manufactured in Drammen, Norway, and installed at the North Sea project site by the first half of 2017. Vessel charter: MPI Workboats has secured a 15-year charter for the MPI Dorothea vessel at Westermeerwind. The vessel will work for Siemens, out of Lemmer, Friesland, northern Netherlands. The 144MW wind farm — the near shore part of the Noordoostpolder project — is under construction in the Ijsselmeer and due for completion in 2016. Project online: E.on's Humber Gateway is now fully operational and only minor works remain ongoing, the developer has confirmed. The 219MW wind farm comprises 73 Vestas V112-3.0 MW turbines and lies in the North Sea, off Holderness, Yorkshire.